Clongriffin Dart Station provides a semi-open space, with glazing offering full view of platforms below and incoming trains, and is naturally ventilated. The light curved roof provides a rooflight letting in additional natural daylight, and reducing the requirement of artificial lighting for energy efficiency. Residents of Clongriffin and the Coast Developments can now reach the city centre in as little as 17 minutes. An important aspect of the station design was that of providing easy and safe access to platforms. The station is located beside the sea and by minimising the components of the stairs, its durability and resistance to the coastal climate could be guaranteed. During the design development issues arose relating to the fabrication, structural integrity, ongoing maintenance and risk of vandalism. It was decided late in the construction process to redesign the stairs, to create a more durable solution that would require less maintenance. The design was manufactured in single stair components that were galvanized in one piece. These were then painted in a controlled environment at the galvanizing plant. The station is located beside the sea and by minimising the components of the stairs, its durability and resistance to the harsh sea climate could be guaranteed. As you move around the staircase the curved nature sets a moiré pattern of solids and transparencies playing against the striking staircase geometries. 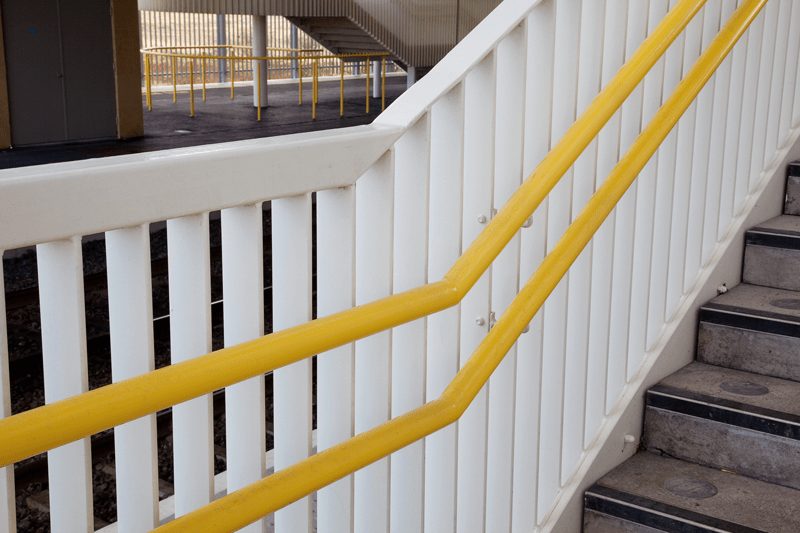 The clean minimal surfaces focus your attention to the yellow handrails which guide you through the staircase.